Doctor and law firm pay-per-click advertising can be very lucrative, but it can also be a huge money pit. You need to make sure you are making the most of your budget. We have found that wasting a PPC budget is all too common. Today, we will discuss everything you need to know about designing and implementing an effective pay-per-click (PPC) landing page strategy. But first, what exactly is a PPC landing page? A PPC landing page is exactly what it sounds like: it’s a page that visitors land on after clicking a paid ad from a search engine results page, as you might find on Google, Bing, or Yahoo. PPC landing pages are fundamentally different from typical static webpages in a few ways, but the main difference is they have a single goal in mind—getting a user to take a specific action. After obtaining the user’s email address or other contact information, companies will then nurture these leads into potential customers. Most business owners will lazily use a website’s homepage or an overview page as a PPC landing page rather than taking the time to create something new and unique. This is a grave mistake. These pages can be helpful for first-time visitors, but in general they give visitors too many options and—as we’ll see—this is more likely to cause confusion rather than conversion. Why Do You Need Unique PPC Landing Pages? It Improves Your Quality Score! Pay-per-click campaigns allow your site to always show up on the top of the results page when your keywords are searched. If a marketer wants to get his money’s worth bidding on keywords, he had better send users to the best possible destination for them to find what they are looking for. A landing page is designed expressly to do just that. 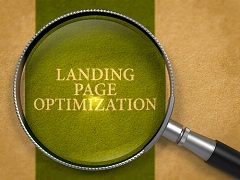 Search engines also consider the engagement of landing pages when evaluating your site. If you have a well-performing landing page, Google AdWords is more likely to show it to people searching for your keyword. This will eventually lead to lower costs-per-click, a higher Google quality score, and a better return on your investment. Your landing page should be TARGETED to readers’ goals. Your reader is responding to the very specific target words in your advertisement. To avoid disappointing him, you need to send him to a page that is responsive to his very specific needs. If a user is searching for “unroasted Guatemalan green coffee beans,” he won’t want to be taken to a page that talks about Colombian coffee brew kits or Ethiopian espresso machines. This is why home pages fail as PPC landing pages. They are too broad and often not germane to what the user was originally searching for. You want users to effortlessly find what they were seeking. In fact, landing pages will often lack traditional navigation bars and other common web page components, in order to focus on their single objective. Your landing page must be READABLE. Landing pages must be easily read by humans. Write content while being mindful of the user you want to reach with these landing pages. If you worry too much about writing for search engines, you will often come off as stilted and phony to potential leads. Too much or too little search engine optimization can end up hurting your search engine rankings. As much as we want to write our web pages with keywords in mind, it’s more favorable to write for potential customers and what they might be searching for. Nothing scares users away faster than a gimmicky, word-stuffed web page. Use clear, easy-to-understand language. Making your landing page RELEVANT will build a positive user response. This one can also be difficult to obey. Page titles, meta descriptions, and headings must be congruent with the PPC ad and the keywords you are bidding on. This doesn’t mean they should have identical content, but rather, be similar enough for a user to know they reached the correct page. A heading that doesn’t match the keyword they were searching will most likely cause them to bounce from the page and check out another site on the search engine results page. This is why you should give them what they asked for. The old bait-and-switch method doesn’t work in inbound marketing, so assuming a user might click through to another page on your site is unrealistic. Be SUCCINT. Keep your landing pages short and to the point. Using a quick and impactful layout will seamlessly move the user from the ad to where they need to be, whether it’s a contact form, service listing page, or subscription page; the process should be harmonious and fluid. Strip the menu bar too if possible. Yes, it’s great to give users the option to explore more of your website, but that’s not the point of a landing page. The point is to get them to convert. Simplicity is your best friend, so avoid cluttered and jumbled pages that are treacherous to navigate. Include SOCIAL PROOF to establish the credibility of the landing page. Show users that the page they are on has been shared on other sites like Facebook, Twitter, and Google+. A fixed bar on the side of web page which includes the number of “likes” can often be a testament to how successful the page is. If it’s clear that lots of people are happy with the page, it can entice users to take action as well. Relevant badges, testimonials, case results or before-and-after sections will also provide that social proof you’re looking for and can often be the most powerful component of a PPC landing page. Everything on the landing page should feed toward the CALL TO ACTION. The call to do something is easily the most important part of a landing page. This gives you the opportunity become a bit more acquainted with the user. After you’ve won his trust, guide him toward submitting some contact information so you can keep in touch. The CTA should be the brightest focal point on the page. Even if your landing page receives tons of traffic, none of it matters if no one completes your CTA. This makes it a critical marketing measurement tool. Typical CTAs for doctors and lawyers include registering for a free consultation, downloading a free eBook, scheduling an appointment, etc. Make it bright and visually striking. Include more than one CTA, too, if you can. Some users might be more comfortable submitting just their name and email first, instead of jumping into a live chat with someone. Conduct A/B TESTING on your landing pages to learn what really works. The best landing pages are continuously optimized. When starting, test out several different landing pages to see which ones resonate more with users. Each variant in the experiment should contain different layouts, images, content, calls-to-action, colors—there are many different variables that can be adjusted. We recommend starting with two or three different pages. Test things out and see what works best. Once you have sufficient data to make an accurate decision, jettison the underperforming ones and keep what works. Never use one single landing page throughout your campaign. Now you’ve got everything you need for an effective PPC landing page campaign. Remember, keep it straightforward, smooth, and to the point. Don’t overwhelm your users with too many options. Build your ads and landing pages in concert, but do not make them mirror images of one another. Also, when starting a fresh campaign, it’s always best to create several alternatives and slowly narrow them over time. Good luck!